Wiseguy Too Two. Courtesy of ViaGen. Three is a charm for event horse Che Mr. Wiseguy—three “Wiseguy” clones were born in April. Wiseguy Too was foaled on April 15, and two weeks later Wiseguy Too Two and Wiseguy Too Top hit the ground. Ecuadorian entreprenur Ronald Zabala-Goetschel competed Wiseguy, an 11-year-old Belgian Warmblood (Jolie—Noblesse), at advanced and completed the Rolex Kentucky CCI**** in 2009. He was frustrated that he couldn’t use the gelding for breeding. “I always wanted to have more horses like Wiseguy…actually I always wanted more Wiseguys,” said Zabala-Goetschel. He tried cloning Wiseguy in 2009, but no live foal was produced. 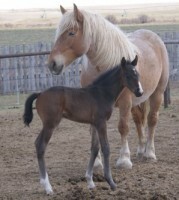 The three cloned foals were created through ViaGen Inc. of Austin, Texas. The foals will remain in Texas for 60 days and then will travel to West Grove, Pa., with their recipient mothers. The clones all have white socks like the original gelding and white on their faces, but the shape of their markings is different. Zabala-Goetschel plans to keep all three clones and use them for breeding and performance. “Wiseguy is a super horse, and I would like everybody to have a horse like him and be as happy and proud as I am,” he said. However, he’s not intending to create any more clones. “I already have three clones of my dream horse, and that is plenty,” he said. Zabala-Goetschel also has a breeding facility in Ecuador, where he’s produced siblings to Wiseguy. Additionally, through surrogates, he bred a half-brother—Wise Cooper (by VDL Corland); and a full-sister—Wise Christine—in Belgium.